Washington’s Hispanic population grew by 70 percent over the last decade, fueling growth from border to border and earning the state another seat in Congress. It’s a trend that held fast for much of the state, from the fast-growing Tri-Cities region to Seattle and Spokane. Hispanics now number 755,000 in Washington state, or 11 percent of the population, according to 2010 census data released Wednesday. That’s up from 7.5 percent in the year 2000. The rising number of Hispanics is “a natural phenomenon in America, and Spokane is no different,” said Ben Cabildo, executive director of AHANA Business and Professional Association, an advocacy organization for minority-owned businesses. The ethnic Hispanic, or Latino, population in Spokane County is 4.5 percent; Asians account for 2.1 percent; blacks 1.7 percent; American Indian or Alaska native 1.5 percent; and 0.4 percent native Hawaiian or Pacific Islander; and 1.2 percent of some other race. For the first time Hispanics became a majority in two counties – 59 percent in Adams County, and 51 percent in Franklin County, the state’s fastest-growing. Franklin County includes the city of Pasco and has a rich agricultural base owing to irrigated farms and many food-processing factories that helped it add 28,816 residents. Yet the state’s 6.7 million people are predominately white – 77 percent. Spokane kept ahold of its standing as Washington’s second-largest city, adding 13,287 residents for a 6.8 percent growth rate between 2000 and 2010. With 208,916 residents, Spokane stayed ahead of Tacoma, which had 198,397 residents. Seattle topped the list with 608,660 people. Spokane Valley, which incorporated eight years ago, made its census debut as Washington’s 10th largest city with 89,755 residents. 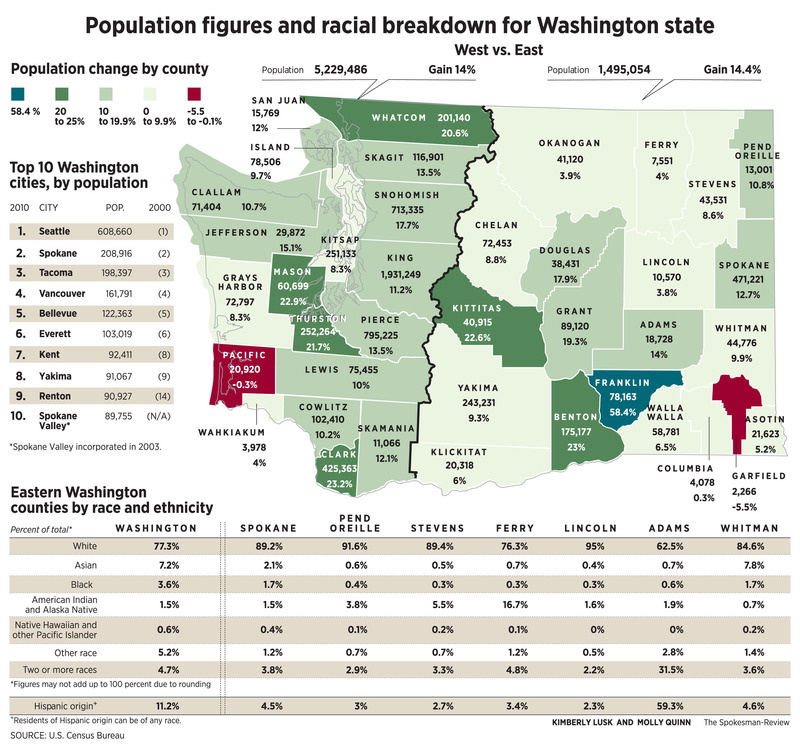 Only two counties in the state lost population – Pacific County along the southern coast, and tiny Garfield County in southeastern Washington, which already has the distinction of being the least populous. The housing slump revealed itself in the numbers. There are 7,020 vacancies among the 94,291 housing units – houses, condos, apartments – within the city of Spokane. There are another 2,293 vacancies among the 38,851 housing units in Spokane Valley. The vacancy rates reflect the growing numbers of homeless in Spokane. “I think we do have a problem right now in Spokane,” said Lucy Lepinski, director of assets for the Spokane Housing Authority. “We have homeless families across the city that are doubled and even tripled up in homes, staying with friends and relatives, and then sometimes staying somewhere different every night,” Lepinski said. There are more than 900 schoolchildren who are homeless in Spokane, for example. Vacancy rates have ranged from 5 to 7 percent during the past decade, said Rob Higgins, executive officer of the Spokane Association of Realtors. “It’s a little higher right now,” he said. The face of Washington is getting a little older, the census numbers show. Last year, 76.5 percent of residents were 18 or older. In 2000, the adult population was 74.3 percent. The official census is conducted every 10 years. The results for Idaho have not yet been released.